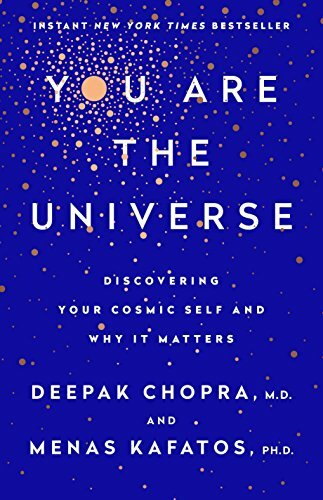 Deepak Chopra MD and Menas Kafatos PhD’s new book, You are the Universe: Discovering Your Cosmic Self and Why It Matters, is a powerful, compelling discussion of an emerging perspective in science that changes the world from a cold, fixed reality to a “human universe.” Mind-blowing is really the best term to describe the book, because whether the reader accepts the ideas put forth or shouts obscenities at the authors before hurling the book at the wall, this work is a powerful, provocative look at emerging thoughts in physics, consciousness, and reality. In our eighth grade science classes, we learned that the universe was created from the big bang and that while it held innumerable wonders, the universe is fixed both in time and space. We might wonder things like, “What happened before the big bang?” or “Is time really linear as we experience it?” Likely, if your teachers were like mine, you were told that there are some questions that cannot, at least now, be answered and shuffled off to lunch. Chopra and Kafatos take on exactly these questions with results that, if true, are paradigm shifting in their scope. Is this possible? Can the universe be “alive” in any sense and does it respond to humans? According to Chopra and Kafatos, the science indicates precisely that. The universe responds to how we think and what we do. It is, in the authors’ view, a “human universe.” It is real because of the ways in which humans perceive it. Simply put, there is no beauty without the human eye to perceive it. There is no universe as we know it without our interaction. One of the book’s strengths is the way the authors employ clear examples to make their points. In explaining the difference between choice and chance, for example, the authors ask us to imagine standing atop a tall building, gazing at the traffic below. If we watched over a period of time, we would expect that roughly half the cars making a turn would make a right turn and half would make a left turn. Which way a car turns would be a random act, given our perspective. But all is not as it seems. There is no randomness at all from the perspective of each driver. One may need to go to the bank on the left and the other to the grocery on the right. Their decision regarding which way to turn has nothing to do with chance and everything to do with choice. Can the same be true of the behavior of subatomic particles? Science suggests yes, that in laboratory settings, particles do not act like inert agents, but make “unpredictable choices between alternative possibilities according to the laws of quantum mechanics.” In other words, the universe has a mind and that mind is everywhere. Agents make choices and what happens around us is not just the swirling flotsam and jetsam of inert matter being batted about. In a very literal sense, creation is current and ongoing through the choices being made in every piece of a living universe. Unless the reader is deeply dedicated to following where science leads, the ideas in this book will be difficult to accept. Yet for those who study consciousness, the ideas presented by Chopra and Kafatos are logical. The principles set forth in You Are the Universe are indeed a merging of parallel concepts in science and philosophy. They give structure to thousands of experiments that until now could only be described as anomalous. The book will be cheered by occultists and mystics who have for millennia believed that the cosmos is alive, or at least an intelligence that has set the laws of physics in motion. Only the reader can decide for him or herself if the arguments in the book are reasonable, but they certainly bear consideration. If there is a fault with the book, it is that it reads as terribly anthropocentric. The idea that we have a “human universe” as opposed to a dolphin universe or an alien mineral universe comes across as self-serving and self-congratulating. Humans are not the apex of creation nor will creation blink out when we pass from the landscape; however, although that is at times how the book reads, that is not the author’s point. By creating a “human universe” the authors are really pointing to human beings as agents of change, beings that have more creative power than we give ourselves credit for and important actors in our world. What is most compelling about You Are the Universe: Discovering Your Cosmic Self and Why It Matters is that if you can hold the ideas set out in its pages as at least possible, you may find your capacity to change your life will be catapulted off the charts. If the universe is indeed human and our minds have the same type of creative capacity as the universe or at least parts of the universe, we have the ability to change our lives in profound ways. We are not hapless travelers on a far-flung rock in a distant corner of space-time. Humans are creative, effective agents of our individual and collective destinies, and its high time we did a better job of using the generative powers of our minds.